When we drove the Infiniti QX50 last year we were less than impressed. However, we are high on the QX50 Concept, which just debuted in full at the 2017 Detroit Auto Show. , but now that the event is in full swing Infiniti has released more images of the interior along with additional info. For starters, it has all but been confirmed that the next QX50 will be the first to feature the automaker’s which is said to be 27% more efficient than V6s of comparable power. The automaker didn’t come out and say that in its press release for the QX50 Concept, but it’s clear that the crossover was designed to fit the fuel-efficient power plant. In addition to having the revolutionary engine under its hood the concept also features a striking cabin. , but this new look seems promising. Infiniti mixed leather types and colors, resulting in a look that is modern and elegant. The human machine interface (HMI), aka Infiniti’s odd name for its infotainment touchscreen, also looks much sharper than what it's currently running out. Hopefully the company does away with that stacked screen setup once and for all. If you like the dot quilting pattern on the seats and door panels you’ll be happy to know that Infiniti has filed a patent for the pattern. That makes it all but a lock to appear in future models. We’re not big on it, at least not at this point, but do understand that Infiniti needs to do everything it can to set its models apart, especially its crossovers. Speaking of standing out, the QX50 Concept has one hell of an exterior design. Infiniti says the hood was meant to resemble a snake’s head, with the new compact VC-T engine allowing designers to reduce the hood’s length. This in turned allowed the A-pillars to be moved forward, creating a more spacious cabin and ensuring that the rakish roofline would cut more into cargo space than head space. Speaking of cargo, the automaker says the QX50 Concept is long enough to store a stroller, so take from that what you will. Infiniti didn’t reveal anything about a release date for the new QX50 or powertrain details, but it’s safe to say the next version of the mid-size crossover will closely resemble this concept. No release date was given. However, Infiniti did say the VC-T engine would make its production debut in 2018. The next QX50 will likely be the first Infiniti to offer said engine, so that means it should be shown in production time sometime later this year before hitting dealer lots as a 2018 model. A lot of things need to be updated but the beefy engine isn't one of them. 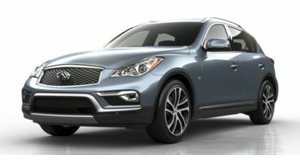 The 2019 Infiniti QX50 grows into its role in the fiercely competitive compact luxury crossover segment.